Laptops are also called notebook computer or notebook. Laptops are often expensive than their desktop counterpart, and yet they have wide popularity among every aspect of modern life. Mobility and lighter allow their owners to travel or work wherever they want, which attracts users from all walks of life for personal, business or school use. Since laptop plays important role in life and work, data loss may cause big trouble. Laptop data loss can result from a variety of reasons, for instance, system crash, virus attack, file deletion or formatting, etc. If you are not among those who back up files regularly, then you are facing the risk of data loss at every minute. Laptops store files on hard drives which is the same with desktops. Laptop drives are smaller than desktop drives in shape, but they possess the same internal structure and works in the same way too. So data recovery software applies to laptop. The most feasible way of recovering lost files from laptops will be using free laptop data recovery software, for shareware is far too expensive to many users. Therefore, Eassos Recovery Free is the best choice for laptop data recovery. Eassos Recovery Free is reliable, efficient and free which supports recovering deleted files, formatted files, recover lost partitions, recover corrupt partitions, etc. 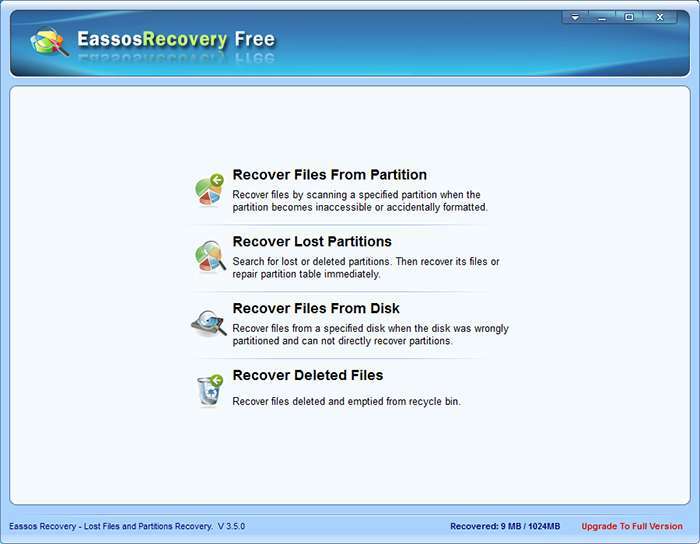 This entry was posted in Data Recovery and tagged data recovery freeware, Eassos Recovery Free, free laptop data recovery software, laptop data recovery software by EASSOS. Bookmark the permalink.